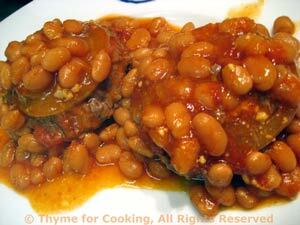 Burgers and Beans on the Grill, Thyme for Cooking easy recipes. Tear off 4 squares of foil (1 1/2 times as long as the box is wide). Peel onion, cut into 8 thin slices and put one slice in the center of each foil. Divide ground beef into fourths, patty and place a patty on top of each onion slice. Top with another onion slice. Spoon beans on top of burger patties dividing evenly. Put mustard and ketchup on top of beans - dividing evenly. Bring long ends of foil together and fold over. Fold in sides, loosely. We cook them on the gas grill for about 15 minutes but you can cook them in the oven - 400F for 25 minutes. When done - unwrap and put on plates. Serve with Brown Rice or quinoa.